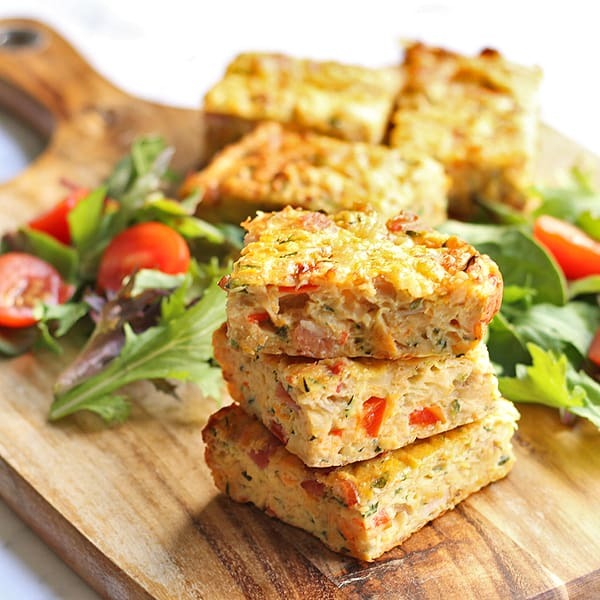 This simple, healthy and oh so tasty Bacon and Vegetable Slice is so versatile. Meal prep a batch for the week and enjoy at any time of the day, or even as a snack. Think of this like a beefed up Zucchini Slice, which I still absolutely adore but sometimes you need to mix it up, right? This slice is just as versatile, meaning you can enjoy it for any meal of the day. I highly recommend meal prepping this on a busy week so you can grab and go a piece on your way out the door, or easily serve with a salad for lunch or dinner. Do I have to drain moisture from the zucchini? Absolutely. Don’t skip this step or you’ll end up with a soggy slice. Grate the zucchini and the carrot together and either pop into a colander or into a clean kitchen towel to wring out. Can I mix up the veggies? Absolutely. I’d recommend keeping onion and zucchini, but feel free to throw in what you have on hand. I think corn and mushroom would taste great! Can I make it with ham instead of bacon? Of course. Skip the frying step and throw the ham and onion directly into the bowl with the other ingredients. How long does the slice keep for? Keep the slice in an airtight container for up to 5 days, or freeze for up to 3 months. Can you hurry up and get to the recipe? Preheat oven to 180C / 350F. Line a baking tray (15x30cm / 6x12inches) with baking paper. Heat 1 tbsp of olive oil in a frying pan on medium heat. Add onion and bacon and cook, stirring regularly, until golden. Remove from heat and allow to cool slightly. Grate zucchini and carrot into a colander, and using your hands, squeeze as much of excess moisture out as possible. 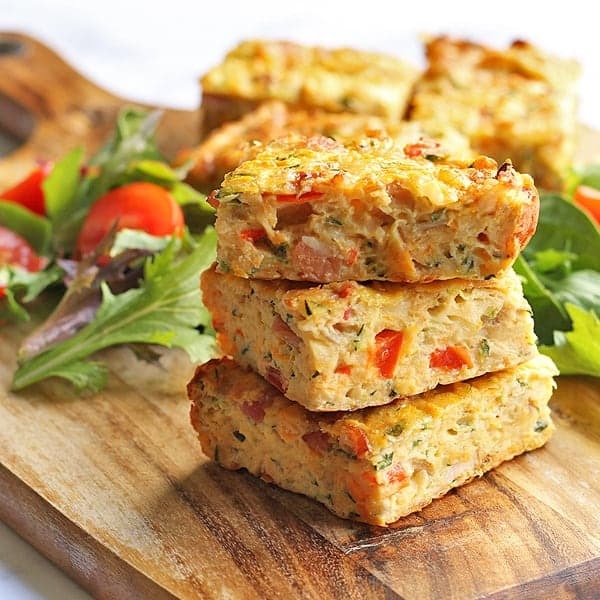 Place zucchini, carrot, capsicum, onion, bacon, cheese, flour and baking paper into a large bowl and stir to combine. Add eggs, milk and oil and stir to combine. Pour mixture into prepared tray and smooth the top. Bake for 35-40 minutes, until cooked through and firm to touch. Allow to cool, then cut into squares to serve. Don't skip draining the excess moisture from your zucchinis. If you do your mixture will be too soggy. You can mix the vegetables up for what you have on hand. I think it would taste great with corn and mushrooms. Store in an airtight container in the fridge for up to 5 days, or keep in the freezer for 3 months. This is a favourite in my house! Lovely recipe! Sounds a lot like a zucchini slice I make. The best part is it make a perfect lunch the next day. I’ll be adding carrot and capsicum next time. Thanks!